A bereaved mum who had a bag stolen containing a lock of her daughter's hair said it was "like losing her all over again". Marie Blay, 77, said she "went to pieces" when she realised the bag had been snatched from her trolley in Iceland in Luton. It contained "priceless" mementoes connected to her only child Geraldine, who died in 2018, aged 57. "It's hit me like a tonne of bricks," said Mrs Blay. "They mean everything to me - she loved shopping, so every time I went into town it felt like I was taking her with me." Geraldine, who had lived with her parents in Luton, went into cardiac arrest during a dental operation and died on 30 March. When the decision was made to turn off her life support, her mother asked to snip a lock of hair - which she then kept in a frame next to her daughter's photograph. Her daughter's gold ring, the frame, bank cards and £8 in cash were in the bag when it was taken from the Park Street store on 21 March this year. 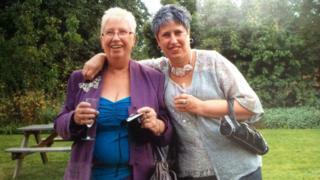 Heather McKinley, Mrs Blay's niece, said the impact on her "heartbroken" aunt had been "devastating". She appealed on Facebook for people to look for the bumbag, believing that the ring - a two diamond crossover type - was "most likely gone forever" but "surely we can find that lock of hair". Mrs Blay criticised the response from Bedfordshire Police, who she said did not contact her for several days. "They didn't bother to come when they would've had a chance of catching them," she said. Her niece added: "We understand that the police prioritise their responses to crimes, but the awful truth is that while this is deemed a petty crime, the impact on my aunt has been devastating." Bedfordshire Police said officers had spoken to Mrs Blay, were reviewing CCTV and would release images once internal procedures had been concluded.